A wonderfully healthy allergy free snack! 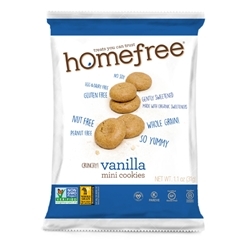 All Homefree products are prepared in a dedicated baking facility. No peanuts, tree nuts, eggs, wheat, dairy, soy (except lecithin), fish, shell fish or sesame. These shelf stable single serve bags are certified Gluten Free, Vegan, Kosher Pareve and Non-GMO Verified. Ingredients: Gluten free whole oat flour, organic evaporated cane sugar, organic high oleic safflower oil, organic pear juice from concentrate, organic tapioca starch, organic buckwheat flour, organic lemon juice from concentrate, organic pure vanilla extract, baking soda (sodium bicarbonate), salt, baking powder, xanthan gum, cream of tartar, rosemary extract.